On March, 6, Kayseri Police Department took lawyers AS, SB, UU, MG, MÇ into custody within the scope of the state of emergency investigations. After 4-day long custody, the all five lawyers were subjected the international travel ban and released. In the province of Kayseri, 40 lawyers were taken into custody, and 22 lawyers have been arrested since the 2016 July. 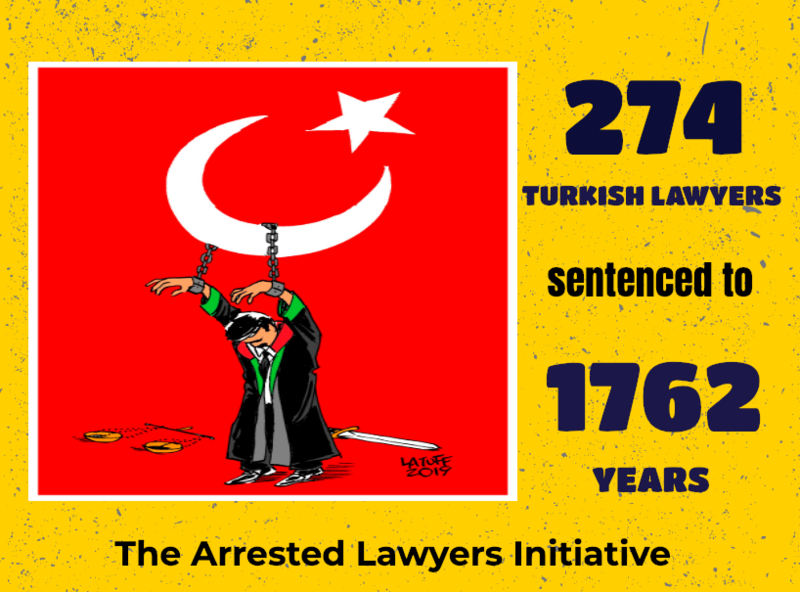 Thus far 13 lawyers were convicted on the charge of being the member of the armed terrorist organisation, and given two to twelve years prison term to them; the remaining lawyers are still under the prosecution. Adana 11th High Penal Court sentenced women lawyer F.Ç.Ö to two years and six months in prison. In the province of Adana, 39 lawyers were taken into custody, and 15 lawyers have been arrested since the 2016 July. Thus far, Adana 11th High Penal Court has convicted eight lawyers on the charge of being the member of the armed terrorist organisation, and given two to twelve years prison term to them; the remaining lawyers are still under the prosecution. On March, 7, Ankara Chief Public Prosecutor announced that a detention warrant was issued for eight lawyers of which six are allegedly has used or dowloaded an i-message application called ByLock. European Union’s Counter-Terrorism Coordinator Gilles de Kerchove described Bylock as circumstantial evidence and said that “You need not only circumstantial evidence – like just downloading an app – but concrete substantive data” to convict someone of terrorism. “Despite Erdogan’s claims, it violates rights for Turkey to detain people for downloading a popular encryption app” said Ken Roth, director of the Human Rights Watch. Fox IT which is Netherland based prominent forensic IT company, debunks (MIT) Turkish National Intelligence Agency’s report on BYLOCK app. “The investigation performed by Fox-IT contradicts the key findings of the MİT. Fox-IT also discovered inconsistencies in the MİT report that indicated manipulation of results and/or screenshots by MİT. What is more, Fox-IT found that the MİT investigation is fundamentally flawed due to the contradictory and baseless findings, lack of objectivity and lack of transparency. Fox-IT has read and written many digital investigation reports over the last 15 years. Based on this experience, Fox-IT finds the quality of the MIT report very low, especially when weighed against the consequences of the conclusions.” was said in the statement by Fox-IT after its forensic survey on the Turkish INTEL’s report on BYLOCK app. March, 5 | ISTANBUL | Lawyer Kemal Ucar (@crkml) who has been representing some soldiers who are on trial within the scope of the coup prosecutions was taken into custody taken into custody and banned from all cases related to the coup attempt. Lawyer Ucar has been under police custody in Istanbul Police HQ since 5 March. Lawyer Kemal Ucar @crkml who has been representing some soldiers who are on trial within the scope of the coup prosecutions was taken into custody.